I used to think the hardest thing about owning a pet was taking it to be euthanized. But I was wrong. The hardest thing to do is to watch it die. Peanut has been sick. On top of the congestive heart failure she's had for a year, she has been taking antibiotics for an e. coli infection. She was getting tired of taking the 9 pills a day and was only eating if I bribed her with people food. Last night, Angel and I went upstairs to get ready for bed at 9. Peanut lay on the landing. I called her upstairs to join us. I knelt down so she would know I was waiting for her. She climbed slowly, but no more slowly than in the past few days. Her front paws reached the second floor. I petted her head and stood up to make room for her. Her eyes widened, her back legs collapsed and she slid down the carpeted stairs to land in a heap on the landing. I was screaming and trying to grab her all the way down. She never made a sound or tried to scramble for control. She stared at me, unblinking. In retrospect, I think she died at the top of the stairs. But I was too shocked to realize it. I raced to the bottom and straightened out her bent legs and cradled her next to me, screaming No, No, No. I was sure I could feel her heart beat. I scrambled to the kitchen to look for the emergency vet number. The one I wanted I couldn’t find. I raced upstairs to get my phone which had the main clinic number. Emergency wasn’t one of the phone options. I had a magnet from a clinic a little farther away, and called them. I was sobbing ragged breaths, but managed to ask the guy how I could tell for sure whether she was dead. He said to put my ear to her chest. I did and heard nothing. I put my hand on her chest and felt a slight heartbeat. That’s when I realized I had been feeling my own heart beat. I asked him what should I do. He said I could bring her to the clinic and they would have her cremated. I thanked him and hung up. I sat on the stairs next to her, petting her, sobbing, for a few minutes. Then I called my sister. She said to wait for her, she would be here as soon as she could. Numbly, I agreed to wait. I got a sheet from the linen closet. I swore I heard Peanut move, and I raced back to the landing, but she was in the exact same position. I didn’t have the heart to move her. I sat on the stairs, petting her and sobbing for probably half an hour. Angel would come by every few minutes to give me love, to get petted, and to sniff at Peanut from about 6” away. She never got any closer. Although she had to have passed her when she came downstairs from the bedroom. By the time I stopped sobbing, Peanut was stiffening. Any doubt I had about her being dead was gone. Barb got here about 9:45 and gave me a big hug. When she saw Peanut, she started to cry and I cried a little more. Mostly I was drained and numb. We decided it would be more dignified to take her to the clinic tonight rather than leave her lying around like discarded trash. I gathered her limp form into my arms. I wrapped her in the sheet. I placed her carefully in the back seat of my car. The limpness of her body broke my heart. We drove her to the clinic. They were very respectful. A man brought a rolling table out to the car. I gathered her up and laid her on top. The sheet came away from her face. I stroked it, close to breaking down again now that I was handing her off to someone else. Back home, I took medication for the migraine I had given myself. Then Angel and I went upstairs to bed - again. I petted and hugged her a lot. I don't know if she realizes that Peanut is not coming back. Peanut was a princess in every sense of the word - dainty, dignified, gracious, demanding, empathetic, forgiving. I will miss her greatly. R.I.P. Peanut, my beloved princess. Dogs and squirrels, enemies or playmates? I have a bird seed block sitting on top of a wooden platform about 3 1/2 feet off the ground. 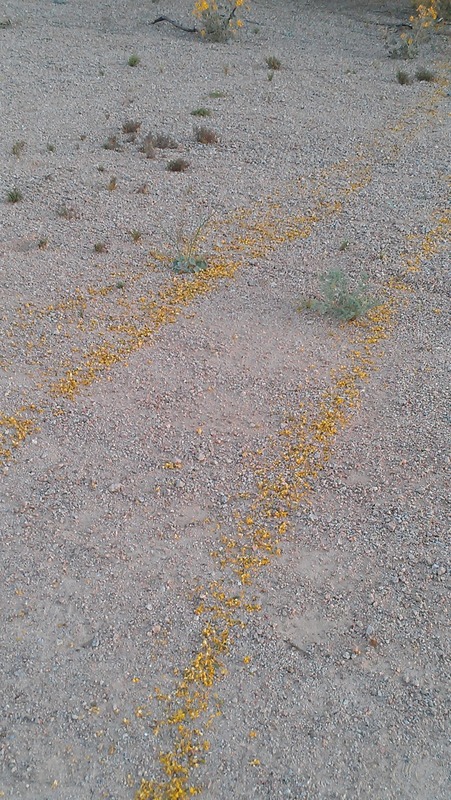 The intended recipients are the Gambol quail that live behind my house. The platform is to keep the dogs from eating the seed. Now, I don’t really care if the squirrel eats the bird block, but Angel likes to chase it. And I am sure the squirrel gets plenty to eat when Angel isn’t looking. Yesterday, Angel went outside and saw it. She chased it. It jumped the 2 feet from the platform to the top of the wall. And laid there, with its tail hanging down a block width, just out of Angel’s reach. Angel woofed and jumped a couple times, then gave up. Only then did the squirrel slip out of sight on the other side of the wall. Cheeky creature. Reminded me of Otto and the squirrel. When I was growing up, the first dog I remember having was a full-sized dachshund named Otto. 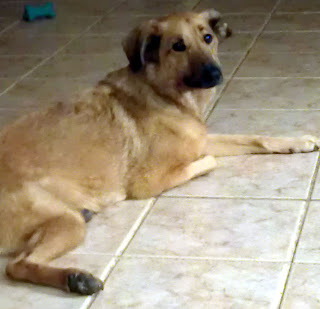 He had the run of the neighborhood, so when he saw a squirrel in the neighbor's yard, he chased it. The squirrel scurried up the tree to escape. Then came back down the trunk, stopped just out of the reach of Otto, and chittered at him, infuriating the dog into a frenzy of barking. Only when we yelled at Otto to stop barking did the squirrel disappear into the leafy canopy of the tree. From that point on, I realized that dog-baiting is a form of squirrel entertainment. I had high expectations that when the television season wrapped up, I would get lots of useful things done. I would read some of my non-fiction books. I would work on stained glass. I would clean house. I would finish house projects. I don't think I watch an excessive amount of television. I watch Castle, Eureka, Lost Girl, both NCIS, The Big Bang Theory, The Finder, Fringe, and Supernatural. I have the TV on for noise when I am working around the house. But still, the time spent on television could be spent more productively. Couldn't it? So as I drove into work today I was all fired up about what I could do when I got home. As I drove home from my desk job, my enthusiasm waned. My brain was fuzzy, my neck ached from hunching over my computer. When I walked into the door, my ambition vanished. Which is why I am now typing this, reading The Bloggess, and catching up on Twitter. I seem to be on a nature kick right now. 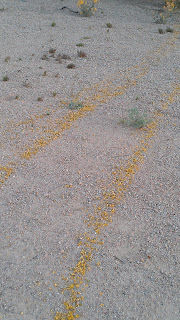 I saw these ants in the retention basin behind my house. 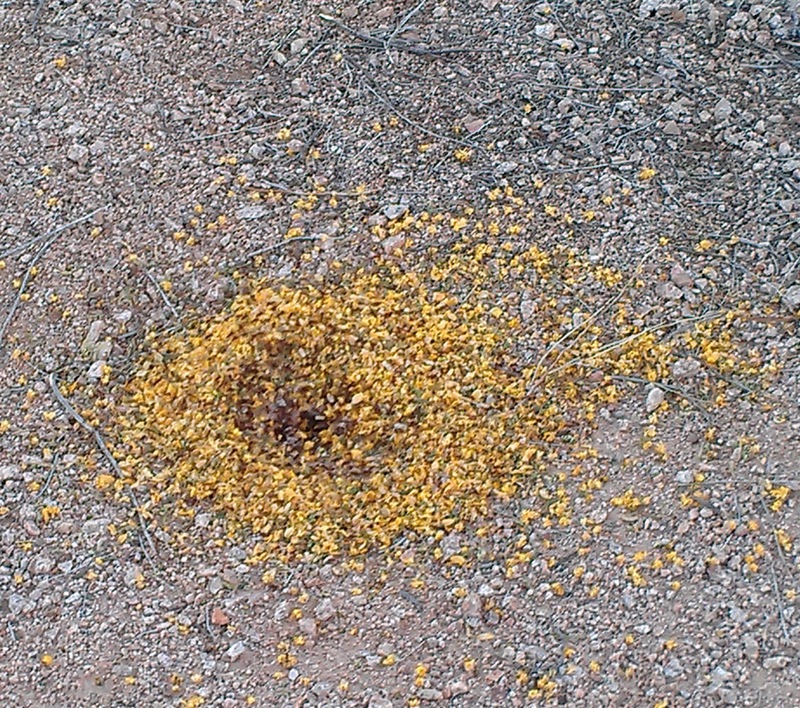 They made a visible trail carrying fallen Palo Verde blossoms to their hole. 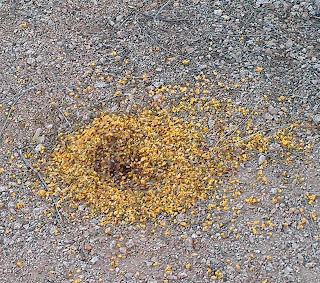 The piled up blossoms made the ant hill very easy to find. I found the activity irresistible. 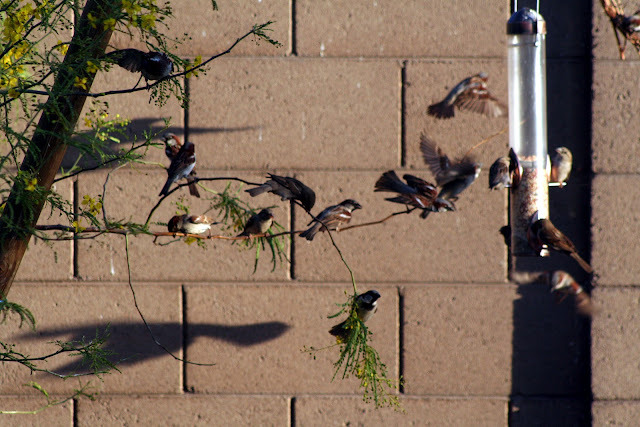 Sparrows, hanging out on the "new" Palo Verde as they wait their turn at the feeder. I love that the new tree has been enthusiastically accepted.